I was blessed to have been raised by very health-conscious parents (in the hills of East Tennessee, no doubt) and we all worked tirelessly in our large organic garden. This was way before organic gardening was “cool”. Daily doses of Barley Green and Brewer’s yeast and family “workouts” in the living room were common at our little house in the valley. Even so, I still viewed myself as the “thick, stocky girl” and struggled with body image through college and adulthood. As a nurse then a full-time mother, I worked really hard to maintain a healthy weight and began to incorporate exercise 3X week to maintain some sanity… a little time to myself. Through perseverance and a couple of good role models, I began to understand the real value and vital importance of staying strong and getting regular exercise. The call to share this new “love of strength” with others, especially women who were intimidated by fitness and/or just didn’t know the powerful life benefits of strength, started to become real to me. 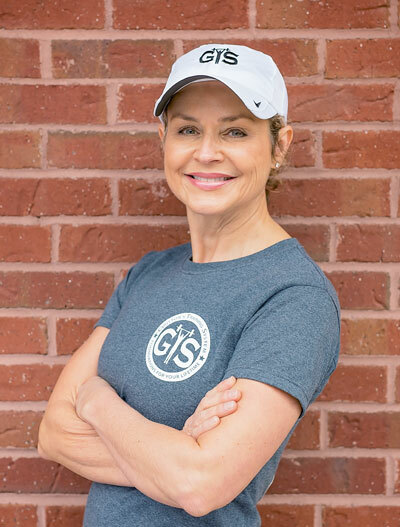 I became certified in personal training and began donating my time at The Bridge in Peachtree City leading classes for anyone who wanted to attend. In 2013, with the encouragement of good friends, I increased my cardio endurance by setting some running goals. Because I still viewed myself as “thick”, I never saw myself as being able to run very far. Plus, I didn’t like running! But at age 55, I finished my first half-marathon in 2 hours and 10 minutes. It was an emotional race! Over the last 6 months, I have reached another goal that I didn’t ever see myself reaching. This one had eluded me for over 30 years. With the help of Jeremy Gritton’s nutritional coaching, I finally reached my wedding weight, shedding those last pesky 5-8 pounds! Make an exercise and nutrition plan for your week and stick to it. Especially as we get older, Weight management is 80% nutrition and 20% exercise. There will always be a “life” that will get us off track, but expect it, and get back on your plan right away. My typical training week includes 3 days of 1 hour session strength training of free weights in a class setting, pilates 1-2x per week and mixed cardio at least 3 times per week. Molly enjoys running and cycling.